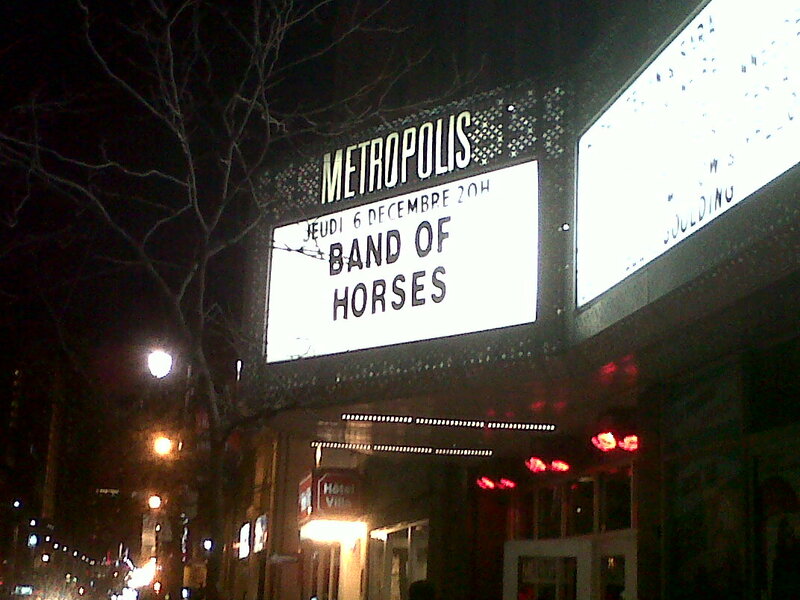 Last night, I was lucky enough to see Band of Horses live at the Métropolis. I'm a big fan of the Seattle-based band and I'd been hoping they would make a stop near Ottawa while on tour promoting their latest album "Mirage Rock". Lucky for me, they scheduled a show in the lovely city of Montréal, a city that I just can't get enough of. The show started on a good note with "The First Song". However, during the following song "The Great Salt Lake", lead singer/guitarist Ben Bridwell was experiencing technical difficulties with his guitar and the sound. He didn't let this affect his performance though, and kept playing through the issues. Afterwards, the issues were resolved and they continued their set with "Weed Party". The group played many songs from their first three albums, including "Marry Song", "Laredo", "Ode to LRC", "Blue Beard" and "Cigarettes, Wedding Bands". And, of course, they played some songs from "Mirage Rock", such as "A Little Biblical", "Slow Cruel Hands of Time", "Everything’s Gonna Be Undone" and "Knock Knock". They played some of my absolute favourite songs, including "Is There a Ghost" and "Infinite Arms", which I was not expecting. To say that I was pleasantly surprised is an understatement. The group also performed "Older", which is a song that I really enjoy and it always seems to get stuck in my head. Bridwell shared with the audience that the song was written by keyboard player Ryan Monroe, who I had the pleasure of talking to earlier that day. During the performance, Monroe did most of the singing and Bridwell joined him at the keyboards. It was a great performance and you could really sense the comradery between the two band members. I was very satisfied with the band's song selection. Bridwell told the crowd that they picked six songs from each album, which is great. In many cases, when a band tours in support of a new album, they tend to focus on the new material. However, I am very happy that all albums were represented equally in their setlist. I'm sure other fans were happy about that as well. Their set ended with "The Funeral", an amazing song that gives you the goosebumps every time you hear it. I also believe that it is the song that the band is most known for. Safe to say, the crowd went absolutely crazy and sang their heads off. It was an amazing way to end their set and I was absolutely thrilled! For the encore, Ben Bridwell and Tyler Ramsey were the only ones to come out on stage. They played a stripped down, raw version of "No One’s Gonna Love You". It was absolutely beautiful! Afterwards, they ended their show with "NW Apt. ", followed by a cover of "Am I a Good Man" by Them Two, a song that I had never heard before. You can tell by watching them live that these guys sincerely enjoying playing music together. They don't take themselves too seriously and they look like they're having a blast on stage. As a concert goer, this is an absolute delight to see. Overall, I am beyond happy with the show. I was pleasantly surprised by the setlist and I am absolutely thrilled that I was finally able to see the band live. Definitely worth the trip to Montréal! Stay tuned for my interview with Ryan Monroe from Band of Horses. Review: Bruno Mars "Unorthodox Jukebox"